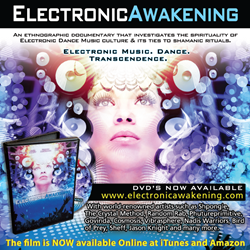 Electronic Awakening DVDs and VOD now available. Released in 2011, “Electronic Awakening” is an ethnographic documentary film Directed/Produced by Andrew Johner, which investigates the spirituality of the Electronic Dance Music Culture. Phutureprimitive, one of the Electronic Music artists featured in the film, is kicking off the nationwide “Dance Out Your Demons” Tour in October 2013. The event covers 32 cities throughout the United States, rounding out on December 21st 2013 in Boise, Idaho. The tour will feature music from the new 2-part album titled “Searching for Beauty in the Darkest Places” as well as launch the music video for “Lucid Dream.” Ritual dancer and performer Caeli La will also be featured alongside Phutureprimitive. To check out the tour schedule, go to: http://www.phutureprimitive.com/tour-dates/ ... Phutureprimitive recently completed a successful Kickstarter campaign for his music video, “Lucid Dream,” which surpassed its $10k pledge by earning over $12k. The project was achieved in collaboration with multimedia production team Vinton Depiction and Michael Miller, the animation/visual effects creator behind NBC’s “Grimm.” The project, which explores the conflict between technology and nature that can be bridged by art, feature breathtaking cinematography, dance, 3D projection mapping, and jaw-dropping visual effects. The video is set to release the second week of October 2013. Random Rab, an instrumentalist and singer, is also embarking on a nationwide tour to promote his new album “Release,” which just debuted on iTunes Top 10 Electronic charts. Random Rab’s music includes influences from trip-hop, classical and Arabic to bass-driven compositions that have earned him the moniker ‘The Master of Emotion.’ For touring details, go to: http://randomrab.com/shows/. Aside from touring, other artists featured in “Electronic Awakening” are currently focusing on album releases, such as English psychedelic downtempo duo Shpongle. In October 2013, they released their 5th album titled “Museum of Consciousness”, which features seven new tracks. To check out the album, visit: http://shpongle.com/museumofconsciousness/us/. Likewise, Electronic Dance Music pioneers The Crystal Method have been at work on new music. Known for over two decades for their enduring dance floor anthems, their self-titled album, set to release on January 14th 2014, will mark the 20th anniversary since the release of their first single. Album collaborations include LeAnn Rimes, Franky Perez, and Dia Frampton. To keep up with their progress, visit http://www.thecrystalmethod.com. Modern psychedelic bass music artist Torin Goodnight aka Bird of Prey also released his full-length album “Flight Patterns” in October 2013, featuring 13 new tracks. Torin has been pursuing Electronic Music for the last decade in the Bay Area, resulting in a fusion of natural and synthetic elements. The album can be purchased here: http://www.addictech.com/p/138908. Aside from being available on VOD on the website, Keyframe-Entertainment, Executive Producer of “Electronic Awakening” and “Lucid Dream,” has recently announced the international availability of “Electronic Awakening” DVDs, which feature extended interviews with Alex Grey, Starhawk and Goa Gil. To learn more about the film, go to: http://www.electronicawakening.com/order.html. About Keyframe: Keyframe-Entertainment bridges underground Electronic Music culture and the mainstream through transformational media (Film, Music, Visionary Art, Community Building, Social Networking, and Events). Its goal is to create global positive change and enhance the living experience by inspiring, informing and entertaining. Keyframe was launched 2004 as a music label and artist management company and over the years expanded its scope to include consciousness films and events.